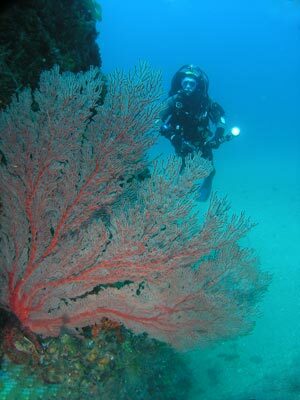 At Sisters Beach there are many different dive sites. Most of these are located around Sisters Island or the rocks between the island and the shoreline. This island is off the eastern end of Sisters Beach. To do this spot, you normally launch your boat at the Sisters Beach boat ramp or you could come from the boat ramp at Boat Harbour further to the east. It is a short 3.6 kilometre run from the Sisters Beach ramp to Shag Rock which is the rock visible at low tide between Sisters Island and the shoreline. East of Shag Rock is Simmos Reef, presumably named after someone called Simpson or Simmons. This is a bommie that comes up to about four metres and has sand on most sides and more reef to the west towards Shag Rock. A good spot to dive is at GPS Reading S40° 54' 41.8" E145° 35' 21.1". This is using WGS84, unlike most of my diving GPS Marks on this web site. If you do not know what this means, read my GPS Page. Anyway, once at the above location, either anchor or drop your buoy. 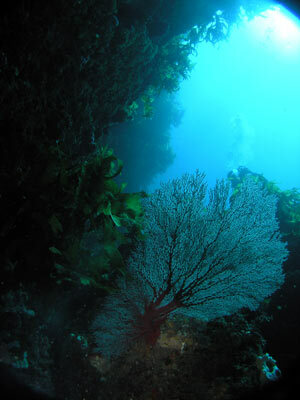 When you enter the water, the depth will be about four metres on the top of the bommie. The reef sort of looks like a figure 6, with the top pointing to the north. The left side of the 6 has the reef running to Shag Rock. Once in the water, drop down the side of the bommie and go to the sand. The depth is 25 metre or so on the sand. 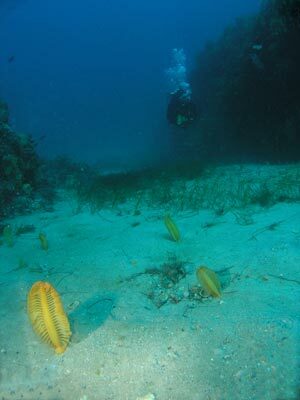 You will see that the reef has lots of large kelp and on the sand there are lots of sea pens. Unlike the ones we see in Sydney, these are a yellow or lemon colour. They are smaller than the Sydney ones as well. As we swim in an anti-clockwise direction. 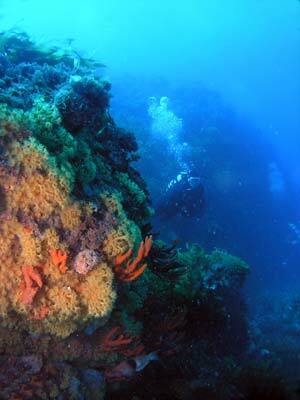 There are lots of sponges (especially red ones), lace coral, bryozoans and gorgonias. The eastern side is especially good for these. On the sand and above the edge of the reef we see a few small long-snouted boarfish. All the boarfish we see in Tasmania are small, but there are lots of them. In Sydney we hardly ever see them, but they are much larger. Other fish seen include lots of red morwong, seapike, leatherjackets of many species and more. There are quite a few species of starfish and we see many very small squid. 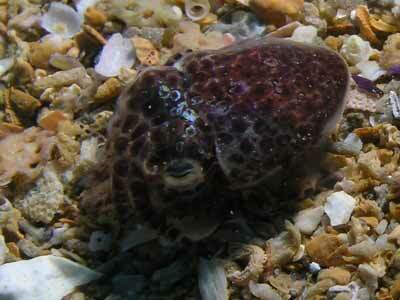 A few small cuttlefish are also seen. We travel up the eastern side of the bommie and enter the small gully created by the top part of the 6 before coming back out and continuing around the northern side and back to the starting point. It is shallower on the northern side, just over 20 metres. After 28 minutes we start a very gradual ascent as we circle the bommie, eventually coming to five metres about 10 minutes later. We do a five minute safety stop and exit the water. The visibility was 25 metres when we dived here in February 2008 and the water temperature 18.7ºC. A very good dive site. The dive shop at Wynyard probably runs out to this location.